In general terms, a lesson plan is a guideline or plan of a teacher for teaching a lesson. It is a road map on how to make students understand a particular subject or lesson to their best in given limited time period. Learning objectives of a particular class meeting must be identified before planning a lesson. Method to check understanding of students after class. To be precise, a good lesson plan should include the goal ( i.e. what students are supposed to learn from the particular lesson), how the goal would be reached (The method) and method to analyze if the targeted goal is achieved (test, homework etc.). What you want your students to learn from. How to make your students learn the lesson you teach. This preparation helps you in managing class time, to remember you what is the main goal that you want your students to take from your lesson and check if you succeed your plan. Once you know the subject of your lesson, its objective and your way to go ahead, it is time to step into the action. First of all, you will have to design specific activities that you can you to make students understand the topic, and implement what they have learned. Students may have heard or learned in previous class or may have some knowledge about the subject that you are going to teach them, so you can start your class with some introductory questions about the topic.This will also help you to understand if your students have any pre-assumptions of the topic and shape your teaching activities in the right direction. Creative and interactive introduction of the topic not only enhance student’s interest in the topic but also encourages their thinking power for it. To catch the complete attention of students and to make them understand the lesson better you need to develop a various way to teach one particular topic. Inculcate more and more example in your explanation, build in time for extended explanation or discussion and at the same time keep sufficient time to take problems and applications. Once you have explained the topic with proper examples you need to check if you have been successful in your aim and if your students have grasped exactly what you wanted to deliver from the lesson. For it, prepare some specific questions, paraphrase them and prepare to ask questions in different ways. Also, anticipate answers of those questions in your mind.You can choose to ask questions orally or in writing. Develop a habit of concluding your topic at the end of the class. This helps you and students to capture and revise important part of the lesson. Try to create an easy to follow and nearly perfect timeline for each part the teaching process, so that you can achieve your target within a stipulated time. Lesson plans are an essential component of a successful teaching experience. Lesson plans help to ensure that all standards and materials are well covered, providing a teacher, mentor, and students with a structure for each class day. Many schools need that their teachers should submit lesson plans in a specific format on a daily, weekly, fortnightly or monthly basis. For teachers who do not have any required format, a different variety of formats are available to meet individual needs. Let’s talk on few of them which could be the appropriate lesson plan format to fulfill an individual’s need. 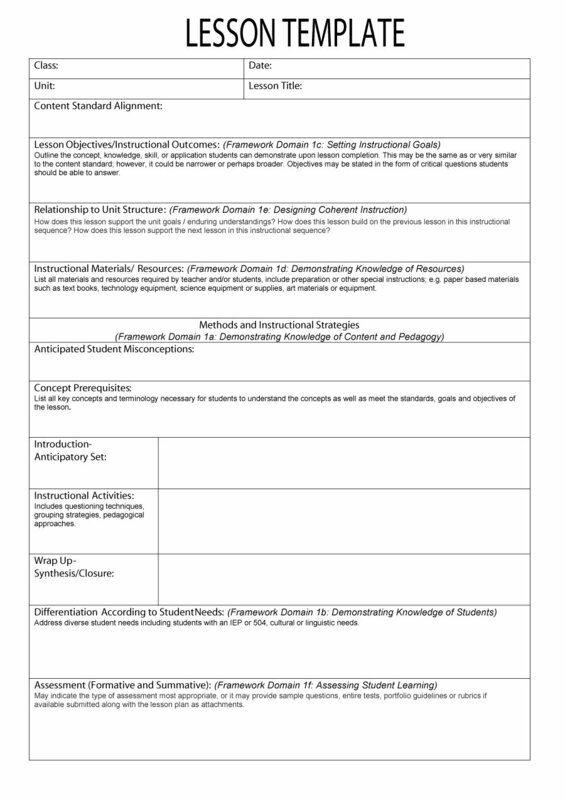 A five-step lesson plan is considered as a form of daily lesson planning that includes the listed components: anticipatory set, guided practice, instruction, closure or assessment and independent practices. In the anticipatory set, a teacher or mentor should note the objective/ goals of the lesson, explain how it connects to previous learning and explain the purpose for what is being learned. These items should be written in such a manner which needs to be a student-friendly form so the teacher can easily convey them to the students during the lessons. For the instructions section, a teacher must sequence list how he or she will use direct teaching through modes such as providing notes, lecturing or showing a video and modeling by demonstrating how to complete an activity or process. This section should also include questions, queries or brief activities the teacher will use to check to see if students are understanding and getting the material & concepts. The third step is guided practice, which asks the teacher to list any activities students will be completed in the classroom with peer assistance or teacher. This is followed by the next step, closure or assessment, which need an activity and require something to help the teacher to get a snapshot of what students learned that particular day. This section can include a last exit slip, a short reflection or something more in-depth such as a quiz or a complete test. Independent practice is the last & fifth section of this format. In many cases, independent practices can be completed in class; however, in the five-step plan, independent practices is the place the teacher lists any homework assignments students will be expected to complete related to that particular day’s lesson. 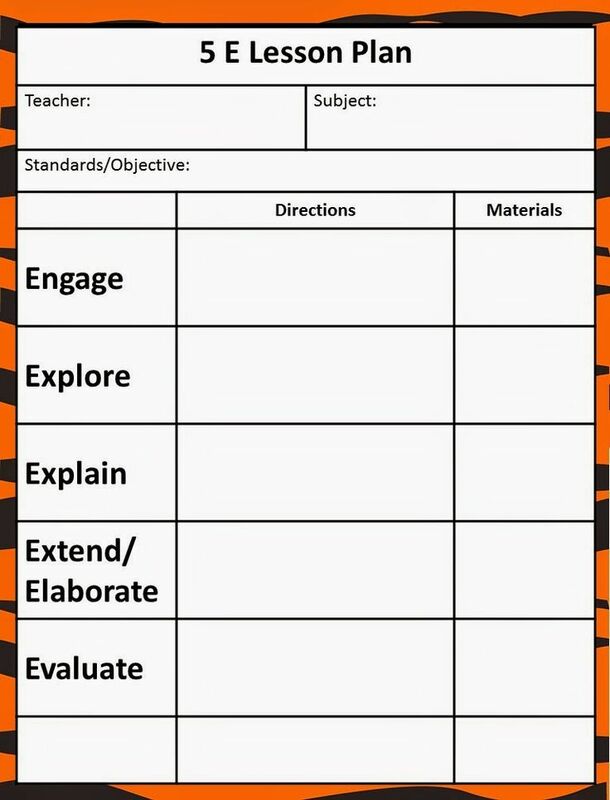 This five-E lesson plan format asks teachers to list all the components which deal with engaging, exploring, explaining, elaborating and evaluating. This lesson plan begins with a query or a question or any brief activity that hooks or engages students at the very beginning of the lesson. In the second phase, the teacher provides a video, or lectures, reading a passage or provide the demonstration to explain the material and its key terms and activities. After explaining the whole concept, a teacher must show what activities students will have to complete to help themselves exploring the material. These items or activities can include stations, cooperative learning groups, games, worksheets or other instructional methods. The second last & the fourth component, elaborating, explaining, can be compared to independent practices. Activities should help all the students to apply the concept to a different variety of situations. This work can be completed in class or as homework assignments. Each five-E lesson plan ends with an evaluation assessment component to determine whether all students have learned the required material. This can come in the form of a formal, graded assessment & checks, or students can be informally assessed with a question and answer sessions, exit slip or short writing prompt. 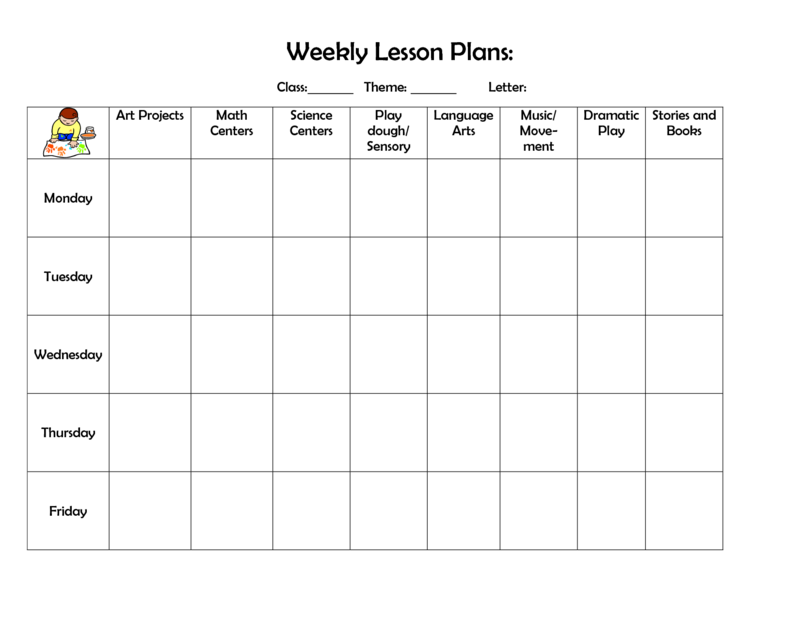 A weekly lesson plan is an ideal lesson plan format for teachers who need to cover a same topic throughout the week. At the top of the lesson plans, teachers should list all the standards, objectives, goals and essential questions being covered that current week. Under that section, each day of the week is listed with a short description of the activities or items for that particular day. At the end of the plan, a section should be included to list any assessments or checks that will cover the week’s instruction, such as a unit or special project or chapter exam. For those teachers who do not work well with elaborate descriptive plans, a unit plan is the simplest way to guide instructions. At the top of the unit plan, teachers list all of the standards and goals, objectives covered in the unit along with the projected time frame for the unit. Below that is a list of all items and activities expected to be part of the unit, followed by a list of all checks & assessments related to the unit. Each day, a teacher presents lessons to students with that particular unit in mind, but since there will be no specific plan laid out, there will be some flexibility in what should be covered each day. Inquiry-based lesson plans are especially useful for the science classrooms because they involve experimentation and hands-on activities that allow the mentor or a teacher to be a facilitator of learning rather than an instructor. Lesson plans that are inquiry-based include very little lectures material or notes. 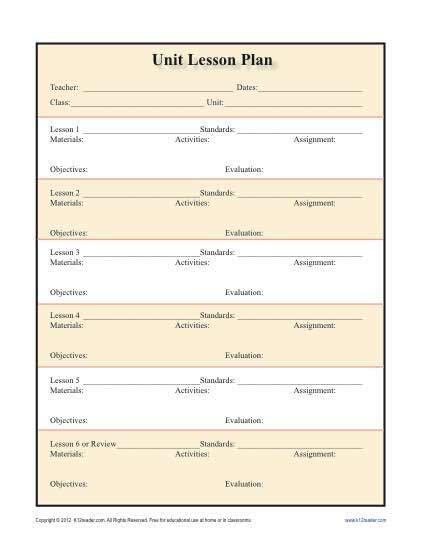 Teachers begin this type of lesson plan by listing all the standards and goals, objectives to be covered. After that should be a detailed description/ explanation of any activities students are to complete during the day’s lessons. Activities should not include papers, worksheets or exams, but instead hands-on problem-solving experiences through experiments, cooperative learning groups or stations which provides practical knowledge in any of the scenarios. After the activity, teachers should list a different variety of inquiry-based questions to check with students to promote discussions of the concepts, items, and material covered in the activity and help further facilitate student learning in an efficient and effective manner. Student’s understanding is the prime and central focus of inquiry learning. Students usually actively participate in inquiry learning experiences by developing questions, queries and investigating to find solutions. Where your students stand right not from the point of view of a particular topic or subject. Where you want him/her to take. How you complete that path. Lesson plans are considered to be a vital component of a teaching and learning process. It is a proper classroom planning which keeps teacher organized and on track allowing them to teach effectively, interact with students effectively, make students understand the topic in much easier and clearer way and enables a teacher to check if a student has captured exactly what the teacher wanted to deliver through a lesson. For smooth and effective teaching, it provides a coherent framework. It helps the teacher to be more organized and utilize their time of class efficiently. In relation to a syllabus, it gives a sense of direction while tracking the course of action. A well-created lesson plan is a proof that teacher has given enough time and done sufficient homework for making his or her students understand the topic.Certain definite functions of a lesson plan are indispensable in a good lesson plan. A lesson plan ensures correct and precise material for the lesson, adequate lesson summaries, and ensures a definite assignment for the class. A good lesson plan enables a teacher to explain the abstract of the topic correctly, present perfectly explained illustrations and introduce and ask pivotal questions to students. Lesson planning gives teacher greater freedom and better assurance of his or her teaching. A wisely prepared lesson plan enables a teacher to enter the classroom with full confidence and anxiety, ready to embark the task ahead gracefully for a job that he has prepared for and understands.It leads him to finish his or her task finish like a workman. Lesson planning saves a teacher from haphazard teaching. It prevents waste of time and energy because it helps teachers to be systematic and organized. It enables teachers to understand correct and most effective teaching procedure, test the understanding of student after class and judge the outcome of instructions. Wisely prepared questionnaire for starting of lesson helps a teacher to get an idea of what student understands or perceive regarding a particular topic and if he/she have given insight about the topic in any previous class, level of their mind and where exactly to start with. A good lesson plan establishes a connection between different grades/ other units of study and between different lessons, it enables and encourages continuity in the teaching process. To summarise we can say, lesson planning is at heart of becoming a good and effective teacher. It’ll process during which a teacher envisions the class meeting the way he or she wants it to occur and produce wanted results out of the class. In order to ensure that teachers address the needs of all your students, it is really essential to write lesson plans that are strategically designed to incorporate state standards, include solid goals, objectives, and fully engage all students in objective-based learning. Incorporate state standards relevant to the subject you usually teach. This is very important first consideration upon which you may build the remaining components of your lesson plan. Melissa Kelly, who is an experienced traditional and online class educator, emphasizes that you should know the requirements of your city, district and/or state, and how they will apply to your particular students based on age and grade level, etc. Design clear, dynamic goals & objectives. Define what all you want your students to learn throughout, and as a result/ output of the lesson. Objectives should encompass all state standards and include active rather than passive verbs that describe actions students should take. For example, this list, sequence of tips begins with an active verb giving direction. Objectives typically include a phrase such as, “By the end of this particular lesson, the student will…” followed by the objective/ goals. For example, “By the end of this lesson, the student will identify various different parts of speech.” The experienced teacher provides an excellent resource explaining how to write dynamic objectives, goals and includes a list of action verbs. To create learning activities based on the objectives and goals. Help your students to reach the desired learning outcomes by creating relevant learning activities. As an experienced educator, Dr. Bob Kizlik, suggested, learning activities must both integrate the objectives and engage all the students. For instance, in the previous example about identifying the parts of speech, you might include a series of activities where you first teach the parts of speech, and then implement matching games, or sentence diagramming, depending on the age and grade level of all your students. Gather materials and arrange accompanying enrichment options and opportunities. If your lesson plan involves learning activities that would need supplemental materials (such as flashcards and interactive games), make sure you gather them well ahead of time. Also, if you plan to include enrichment opportunities such as a field trip or a guest speaker to address your class, make those arrangements and secure dates and times. Need to implement what is necessary to effectively cover the objective, not be an extraneous “busy work” activity. Choose the best delivery method for your lesson plan and decide whether this lesson plan would be best suited to delivery via lectures, handouts, PowerPoint presentation, interactive game, flip chart, or various different other methods. Then do what is necessary to prepare the lesson in that particular mode. Kelly also emphasized that you combine methods to address different learning styles, such as a lecture combined with a group discussion or an interactive good learning activity. Determine how to evaluate and assess learning and progress. All lesson plans should include a way to assess and evaluate learning; you want to measure how well your students meet the goals and objectives and how far they progress toward learning outcomes. Dr. Kizlik suggests that setting milestones to help you determine how well students progress toward the objectives, as well as to indicate where you may need to make changes to improve the lesson’s effectiveness. Design your evaluation assessment method to best measure learning relative to your particular lesson plan. 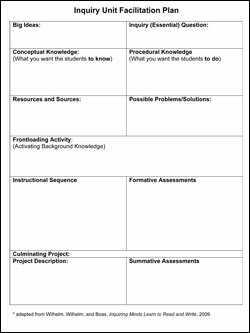 Use a unique template to create your lesson plan. 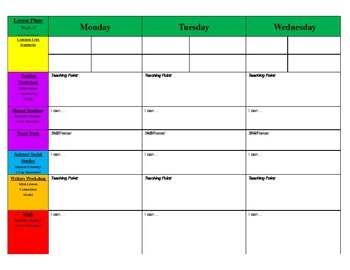 It is very important for each student to plan the daily schedule for each student. It is very important to plan your day. So that we can meet our special needs and no important work should be missed. It is compulsory to ensure a way to organize each orbit. And children of that discipline should also follow. You can use a page to create your daily plan. Simple templates are also available for your convenience on our site. 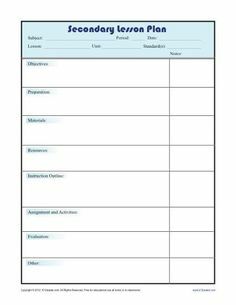 Those who plan their work from day one, they can use this form, which includes supportive materials and list of messages and other details in place of a framework. A short-term plan means for less time when you adapt to your needs, this short-term is called Lesson Plan. “Short-term planning helps you define work in a short period of time. As a normal person, you need to prepare a short-term plan for each day. It is very important to have the experience to create a plan. In the normal life, you should also plan for your children so that they learn from you as well as strategies from childhood. While teaching any lesson, teachers also face challenges. We must be aware of our objectives well and must fulfill our responsibilities properly. Properly said if someone is going to participate in student tests then they are playing a high stake. All states and states should strictly follow all the rules. Students who are specially given the services themselves need to provide as much access as possible to the special general education curriculum. What is complicated by the fact that children can actually succeed on high test, and get a regular diploma from High School? 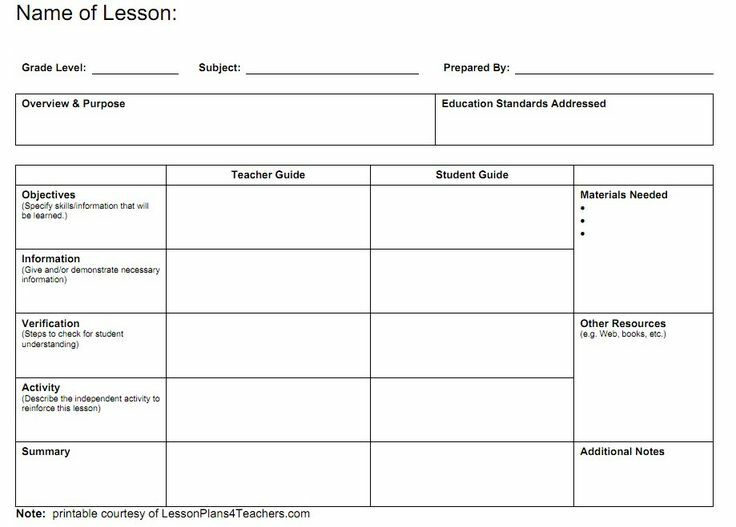 A mini-lesson plan is a framework that describes what will be taught, how it will be taught, and how the example will be used. There are four basic classes: purpose, method, understanding to understand, and implementing knowledge. A small lesson is a fundamental forerunner for a particular subject. You may consider this, but this can benefit students in few minutes. You have to focus on your goals and control the activity smoothly. During this, you have to make sure that whatever students have learned they can understand whether or not they can implement it or not. This question can be traced by asking. With our templates, you can certainly meet your customized needs. Teachers need to prepare their lessons completely and accurately so that they can explain it to the students in the right way. For this, they need to plan. 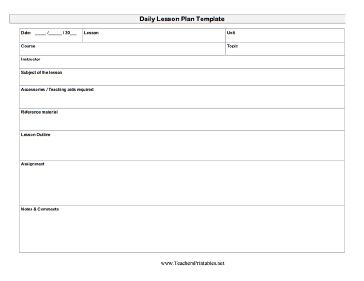 A weekly lesson plan is a plan that has been created by teachers. This objective – for its week for completion, it is basically a plan in which a lesson will be taught every day of one week, you may also like it. A busy teacher should follow the weekly lesson plan, in this way they will determine their objectives, what new things you are going to teach. 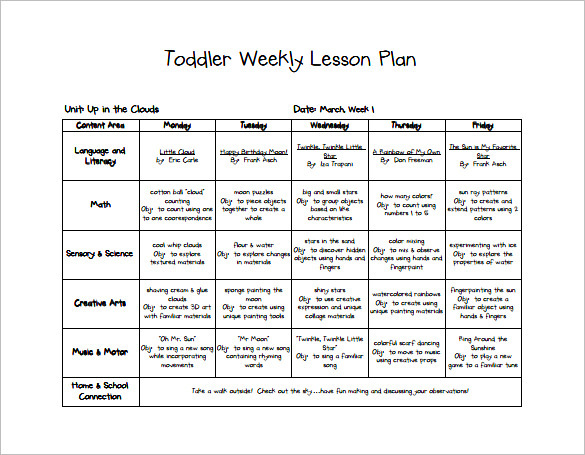 Toddler Plan templates are mostly used by people who work in plays. For them, there is no better lesson than these templates and those who focus on the plays. Various activities of the text plan here include adequate dump and filling opportunities, ramps and rolls and games where small people will understand the causes and effect relations. Some examples are also being sponsored for focused activities. This pack is put together by Wiltshire Early Learning and Development team. It should be recognized that these are just examples collected from a category of teachers and Internet websites do not work according to the order and Wiltshire does not support ELD team. But hopefully any planning the format will follow the requirements of EIFAS properly. In the teacher education program, we are developing standard templates for commentary plan and commentary for both primary and secondary partners. 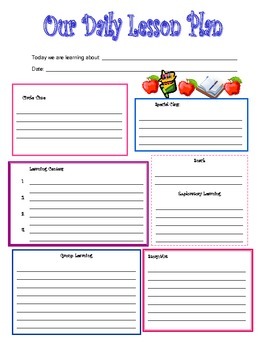 We encourage all our newbie teachers to use our chapter plan template to write their lesson plans. We expect that they use templates to help determine the goals and goals. The author’s permission is not required to download it.